Ectopical meningiomas (extracranial meningiomas) are extremely rare: despite being one of the most frequently diagnosed primary intracranial tumors, meningioma rarely occurs in several locations such as the head-and-neck region, skin, bone, peripheral nerves, retroperitoneum, and lung., Different histogenetic and pathologic mechanisms have been proposed, but the true etiology of this tumor is still uncertain: Some authors believe that extracranial meningioma might derive from misplaced or migrate arachnoid cells, other investigators have revealed that the tumor may originate from perineurial cells or pluripotent mesenchymal cells. An 80-year-old male, from whom we obtain the consent form, during the follow-up for thymoma (previous thymectomy in 2011) and kidney cancer (previous nephrectomy in 2012), presented a solitary pulmonary nodule in the superior lobe of the right lung as detectable by means of 18F fluorodeoxyglucose (FDG) positron emission tomography (PET)/computed tomography (CT) scan in December 2015 (injected dose 380 MBq). 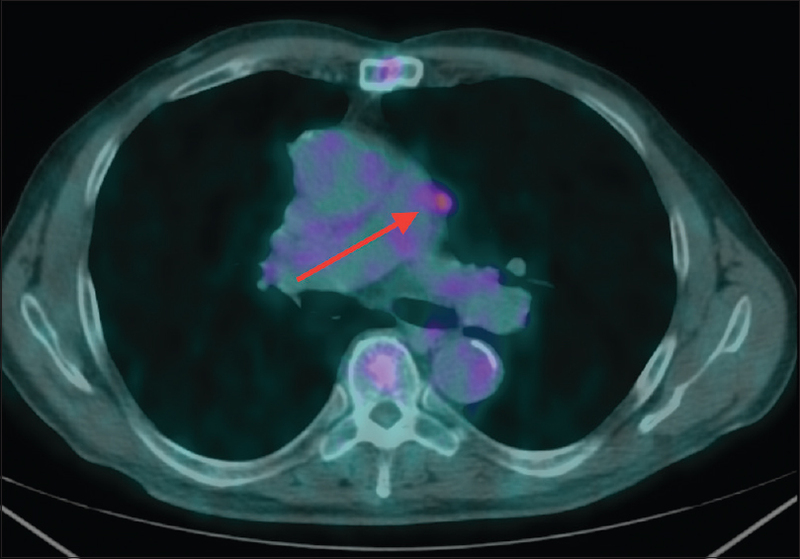 PET/CT images showed a metabolically active lesion (SUVmax 4.63 g/ml bw, 14 mm in diameter), suspected of being a metastasis [Figure 1]. 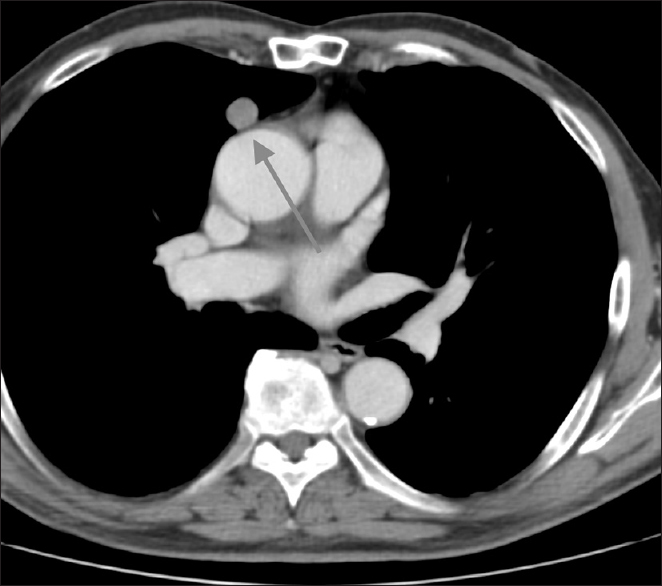 Contrast-enhanced CT with iodinated contrast media performed after PET examination did not show significant attenuation between pre- and postcontrast phase [Figure 2]. After a right pulmonary resection in January 2016, bioptic diagnosis of the nodule was compatible with fibrotic (benign) pulmonary meningioma. In June 2016, another 18F FDG PET/CT scan was performed in the same patient (injected dose 361 MBq) that showed another new metabolically active pseudonodular lesion (SUVmax 2.46 g/ml bw, 12 mm in diameter) in the superior lobe of the left lung [Figure 3]. 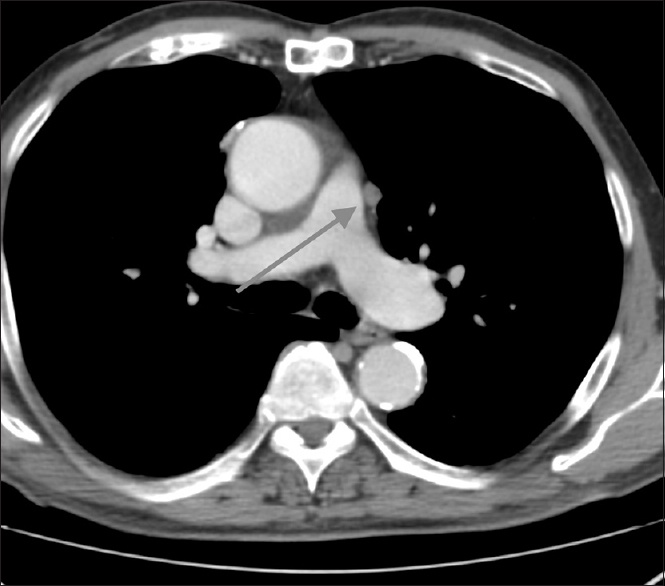 A CT scan with iodinated contrast, the lesion showed enhancement at postcontrast phase [basal scan:-1 HU; postcontrast scan: 55 HU, [Figure 4]. After an atypical resection of the superior lobe of the left lung in September 2016, biopsy showed a high proliferative activity with a number of mitotic figures >20/10 HPF, Ki-67 ≈ 20%, with associated necrosis and on immunohistochemistry cells expressed epithelial membrane antigen and they were positive for vimentin and progesterone: the final diagnosis was anaplastic meningioma (malignant). 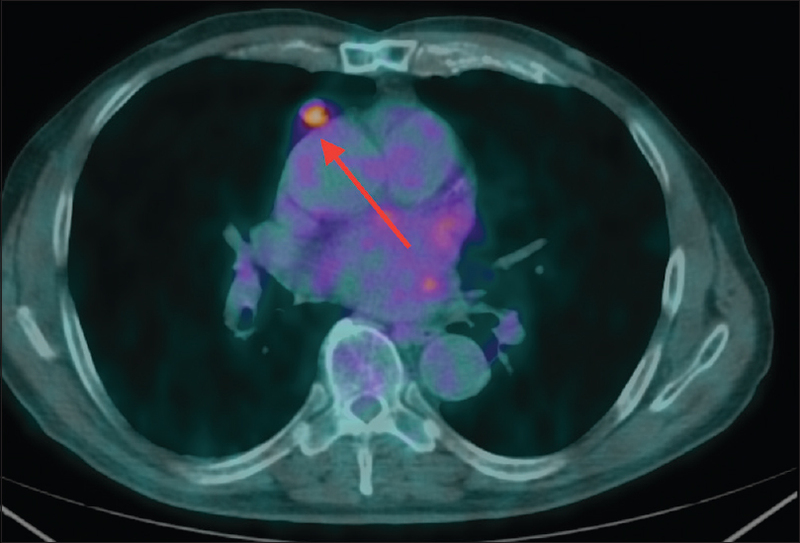 To the best of our knowledge, this is the first 18F FDG PET/CT evaluation of a patient with synchronous benign and malignant PPM, with similar dimensions (14 and 12 mm in diameter): qualitative and semi-quantitative (SUVmax) analysis with PET suggested less metabolic activity in malignant PPM, with more intense uptake of 18F FDG in fibrotic PPM. Furthermore, anaplastic meningioma showed enhancement with iodinated contrast media. From this case report, we conclude that 18F FDG PET may not suffice in the evaluations of patients with PPM; the conjunction with contrast-enhanced CT may help in the discrimination between malign and benign lesions. Furthermore, due to high levels of expression of the somatostatin receptor subtype 2 in meningiomas, the use of other radiolabeled compounds (i.e.,68 Ga-DOTATOC PET/CT ,) may be more useful for this aim. Kim YY, Hong YK, Kie JH, Ryu SJ. Primary pulmonary meningioma: An unusual cause of a nodule with strong and homogeneous enhancement. Clin Imaging 2016;40:170-3. Mao YQ, Zhang W, Yin WJ, Zhu SX. Primary ectopic atypical meningioma in the renal hilum: A case report. BMC Cancer 2014;14:763. Lepanto D, Maffini F, Petrella F, Colandrea M, Putzu C, Barberis M, et al. Atypical primary pulmonary meningioma: A report of a case suspected of being a lung metastasis. Ecancermedicalscience 2014;8:414. Kemnitz P, Spormann H, Heinrich P. Meningioma of lung:First report with light and electron microscopic findings. Ultrastruct Pathol 1982;3:359-65. Caobelli F, Facchetti F, Pizzocaro C, Ferrari V, Savelli G, Guerra UP, et al. A very unusual and aggressive form of a primary pulmonary meningioma seen with a 68 Ga-DOTATOC PET/CT image. Rev Esp Med Nucl Imagen Mol 2015;34:123-4.